There are many factors that change the way we eat as we age, from the ability to cook easily and safely to loss of appetite to a change in tastes. One study shows that some seniors experience a reduced sense of taste, which can lead to eating the same rich, salty foods over and over again – contributing to micronutrient deficiencies. This can also lead to the excessive intake of sugar and sodium, known to exacerbate common health conditions in older adults. Other nutrition advice is to enjoy foods that will enhance absorption of vitamin B12,, such as fish or shellfish, and dairy products fortified with Vitamin D that will help your body absorb calcium. Most seniors will also benefit from plenty of fiber and potassium to aid digestion and keep their blood pressure low. In addition to enjoying regular, healthy meals for seniors, talk with a physician about what foods would be best with specific medications and health considerations. Combined with exercise, like spin class, chair exercises, or a stroll through Chattanooga’s own Barn Nursery, healthy eating can have you feeling your best, and can be confident you’re getting what your body needs. But just because a recommended diet calls for eating healthy and filling up on leafy greens and lean proteins, doesn’t mean you can’t enjoy the occasional treat. That’s why we invite residents to join us on Lunch Outings to restaurants like Wally’s and Zaxby’s, in addition to our regular Dining Room entrées. These treats can be consumed in moderation, with approval from your physician to create a healthy, balanced diet. These treats include dark chocolate, a glass of red wine, naturally sweet fruits like dates, or a handful of rich walnuts as a snack. There are so many different ways to savor your golden years, and eating well is just one part of the wonderful experiences you can enjoy. 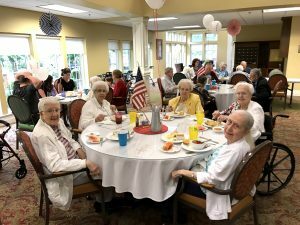 A senior living facility like Rosewood only makes it simpler to get the most out of life, from nutrition to fun!